How many people have their own Navy of classic Boston Whalers? 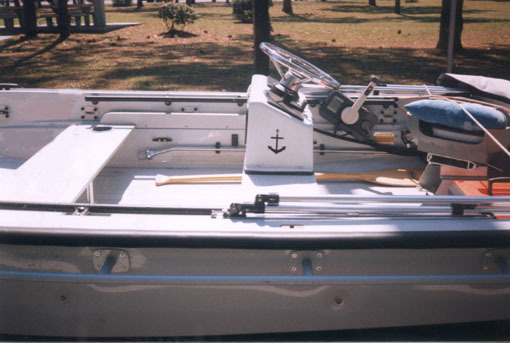 Clark Roberts of Spruce Creek, Florida has owned over forty Whalers, known locally as The Spruce Creek Navy. "Spruce Creek is a tidal creek which empties into the Intra Coastal Waterway opposite Ponce de Leon Inlet at New Smyrna Beach, Florida. It is just south of Daytona Beach. It's only about fifteen miles in total navigable length, but it has over 30 Whalers in residence in its approximately three miles of inhabited shoreline." Here's a look at the operation down there and a few of the boats recently deployed by Clark in the "Navy." Clark's "Navy" even has its own emblem! 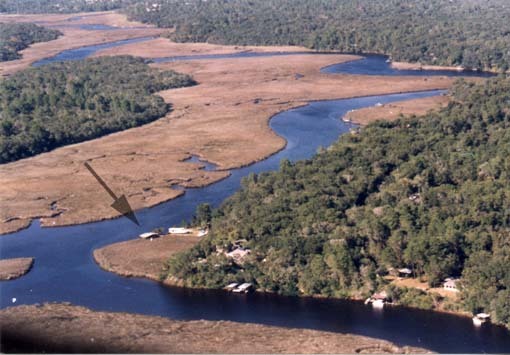 Pure tropical fresh water jungle at its head, Spruce Creek is a salty oyster bed at its mouth a few miles downstream. An aerial view of Clark's Navy Base. Operating in Spruce Creek requires shallow draft, a characteristic reflected in the boats in this Navy. Here's Clark Roberts and his "killer" 1977 Whaler 15-foot Custom Center Console. On the transom is a 40 HP 4-cylinder Mercury engine on a 5-inch Jackplate. Also note the custom rails and swim platform. "A wonderful skiff," says Clark. 13 Alert Dive Boat, "Dive 1"
Clark bought this unique 13 Alert from Whaler Commercial Products Warranty Manager Jon Smith. Whaler built this one-of-a-kind 13 as part of some promotional activity, and they christened her "Dive 1." The boat had the inside and outside rails, but just two thwart seats. 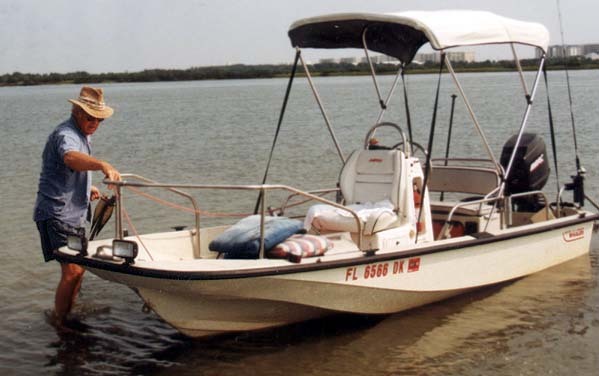 Clark added a custom side console, bimini top, relocated the inside rails, and powered the boat with a 25-HP short-shaft Yamaha outboard, mounted on a 10-inch set back Jackplate. "She screams," says Clark. "Alas, the boat now lives in Panama City. I should have kept her; she drew such a crowd!" The 25-HP Yamaha hangs on a 10-inch setback Jackplate. With this set up the boat would run on plane in only ten inches of water! Details of the interior are seen here. An 11-foot Whaler hull turned into a custom center console. "Custom everything," says Clark. In the background, the fuel depot at Navy HQ. 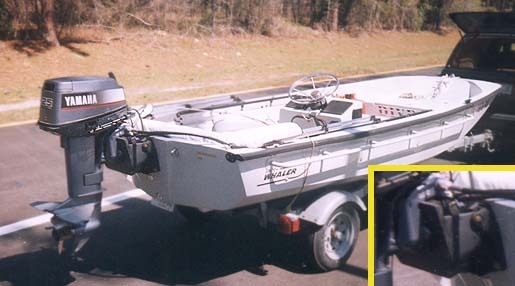 "Custom everything" includes the console, its grab rail, the side rails, and the swim platform. 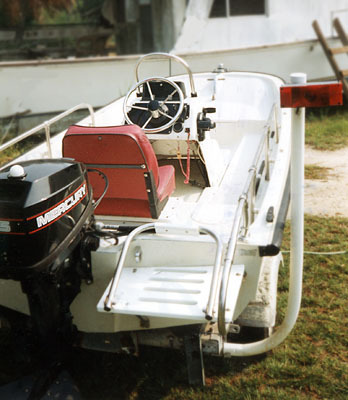 On the transom is a 15-HP Mercury. I think that is the stern navigation light built into the engine cowling! Cool! Hey--where's the jackplate for this one? 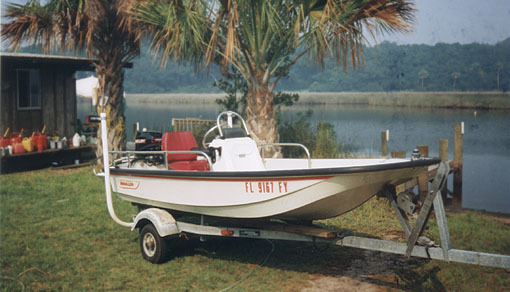 Clark's current fleet includes a 21-Revenge, a 17-Montauk, the 15-Center Console shown above, and two 13-footers, one with 40-HP Mariner and remote controls and one with 20-HP Mercury and tiller steering. A 23-Conquest (that belongs to friend) is also currently at the dock. Clark says the Montauk may have to go to make room for an old 19-Outrage project boat that he has an eye on, with plans to convert it into a 19-Lo-Profile. Stay tuned for more details and more pictures as the fleet changes. DISCLAIMER: This information is believed to be accurate but there is no guarantee. We do our best! The page has been accessed times. Copyright © 1999, 2000 by James W. Hebert. Unauthorized reproduction prohibited!